Rock bar is in Ayana Resort, Jimbaran. 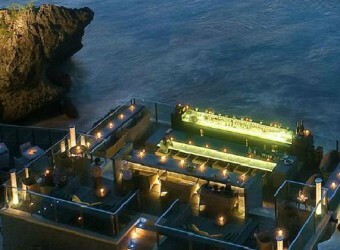 It is the great view bar built on coral reef cliff. It is in the high-class resort, so you might feel uneasy to go there, however, you can go visit there with semi-casual dresses. You will be impressed great location that is really close to the ocean! The view was great but the price of cocktails and beer was too expensive. However I got the best memories f a lifetime with my girlfriend on holiday in Bali.